Rob- nice guy & a cheater too! Kev, please explain to us why can't Rob duplicate his 70+ mile days in the Rockies and in the Mojave Desert? You truly are an idiot the size of Neptune. poor word choice - this has mostly been covered before, but I haven't seen all the data and timelines in one place. Not sure if anybody has pointed out that he did indeed cross the desert leaving the RV stuck in the sand, or where he was likely picked up. Don't have the best explanation for how the 21.86 mile segment came about. 1) top entry, 2016-05-18, 7:31 4.61 mi, 48:07, 10:26 min/mi. Look at the shape of the curve, a NE route bearing about 60 degrees, then with a slight straightening to 90 very briefly before a hard left to about 350 degrees. 2) second entry, 2016-05-18, 4:47, 3.81 mi, 2:50:30, 44:45. Notice it's NE direction bearing about 55 degrees with a little wobble to the north right at the end. If you look at the path leading up to where they got stuck: http://imgur.com/BpEkYyq you will see that they were off the highway running on some dirt roads that stairstep along the highway. I think Entry #2 above corresponds to this, and the little jog to the north is where the road unexpectedly deviated from the highway, then they got lost, driving up the wash instead of the road, and got stuck in the sand. That segment took 2:50:30. He had just come off a 2.87 mile stretch where he clocked 6:18 pace over 18:08. We don't know if he started entry #2 at this pace or not, but it's only 3.81 miles. It could have taken anywhere from 30 to 90 minutes but that entry shows he was with the van for at least an hour, probably closer to 2, while it was stuck. Remember the tracker is in Eastern, so the times below are converted back to local Pacific time which is what the EXIF and TomTom data are. Notice that the tracker passes his route between 9:42 and 9:54 going the speed limit, a stretch of about 10 miles done in 12 minutes. The next stretch, which includes a full stop and hard right turn to the west at Hwy 163, was also 12 minutes, but they covered 12 miles. The following stretch, starting at 10:06, did some weaving through the mountains. They covered 11 miles in 12 minutes. Putting it together, unless they stopped for 2-3 minutes on the straight stretch heading north on 95, that was their slowest of the three segments. From a timeline standpoint, where do you think RY was? Well, at 7:31 he was leaving the RV. 48 minutes later, he was headed north on 95. That would have been 8:18 in the morning, about 90 minutes before the RV came by. This is the last TomTom segment summary we have of him before Laughlin, heading north on Hwy 95 at 8:18am. The next entry is a 21.97 mile stretch over 3:42:16 averaging 10:06 miles (see bottom of the photo). We donâ€™t know what time it started or what it looked like, but I think it is from the last part of the run INTO Laughlin because of the next segment times and shapes. Check-in timestamps have them leaving Laughlin at 00:00 Eastern (21:00 Pacific), which coincides with the 9.71 mile run starting at 20:55 on 5-18. The shape of that run also shows a slight jog to the north coming out of Laughlin and then east as 68 curves east. The next 3.38 stretch corresponds to the little mountain pass centered at http://bit.ly/1UVsnbL. The next 13.8 mile stretch is over a long flat stretch, and then the 7.96 is obviously going through Kingman, AZ. Timestamps match up. So back to the missing segment(s) heading north on 95â€¦ We know that he was at Laughlin sitting beside the pool at 12:52pm. It is about 35 miles from the end of his last known TomTom segment on Hwy 95 where he was at 8:18am. So 4:34 later he is sitting by the pool with his flip flops after playing roulette but before taking a shower. Forgetting the roulette game, thatâ€™s a 7:49 pace. Ok, they say he went off the highway (unsupported, and how was he carrying water?) and ran 21 miles to Laughlin. This lines up with the cut off segment of 21.97 miles. From a timeline standpoint, this would have been right on 12:00 noon for an arrival time. Timestamps show a 13:42 Eastern/10:42am local time arrival of the RV. Departure wouldnâ€™t be for another 10 hours. The main issue here is that the data and their story kind of line up, but the story is preposterous. He was unassisted in the Mohave Desert back country for 4 hours under 95 degree heat running 10-minute miles... and that's the segment they don't show us. The alternative to the unassisted 21 mile crossing of the desert at 10:06 pace is that they picked him up on Hwy 95, then either ran the watch while he was in the car, or drove the mileage afterwards, and let the watch run for an acceptable duration. Both scenarios are somewhat fantastic, but more probable than the crossing imo. This doesnâ€™t really answer the question about how RY got to Laughlin, but it helps resolve the timeline and shows us where RY could have been picked up. I think it also shows he _was_ running solo across the desert (at least up til 95). It also shows that they covered less ground on that straight stretch where RY would have been trudging north along the highway alone, in the 90 degree heat than on the two following stretches, which had turns and weaved through the mountains. RE: Robert Young fakes run across America 6/15/2016 5:05PM - in reply to Rob- nice guy & a cheater too! Because now there are sausage rolls involved. Everyone knows it's serious when sausage rolls come into play. RE: Robert Young fakes run across America 6/15/2016 5:08PM - in reply to Calling out the lrc troops!!! It's time to get Letsrun people off their asses and start following Rob and say hi to Laz & his team. Isn't Terre Haute the place where they hold many NCAA cross country championships? It will be difficult for most lrc'ers to run that slowly. But I guess it should be possible to run 4:30-5:00 miles back and forth and say hello when they "fly-by" (learned a new word here) the turtle runners. Life is sometimes strange. I have observed Robert Young, ultramarathonmanuk for two nights now. I have observed him running, very fast at times, slowly at other times, walking and taking rests, sometimes lots of rest. Still, he appears to be running out of energy and drive. Questions about the veracity of mileage being recorded on this effort began within the first few days of the run. Long before Robert reached the place where the famous â€œAsher videoâ€ was recorded people were wondering about the record paces run for segments, and the multiple quality six-day performances being recordedâ€¦ consecutively. I had commented that I might go visit when he got to Ohio, thinking I would do so on my return from the Great New York Running Exposition 100 Mile. That was not to be. Boots (running shoes) needed to be on the ground, immediately. I changed plans to meet the run and the other â€œGeezersâ€ in Indianapolis. As I made my way northwest, it was apparent the Transcon had slowed; perhaps the rendezvous would be in Terre Haute. That was not to be either. I ended up finding Rob, his team and the Geezers a few miles west of St. Elmo Illinois at noon on Monday June 13. I met Robert, who is indeed a likeable and friendly man. (This does not say anything about his running ability, his previous claims, or claims during this run. My objective was to observe and report. I am doing that now. The fact is, however, that he is friendly and welcoming. He converses about a variety of topics, and as laz has pointed out is somewhat naive about many aspects of running, particularly multiday running.)) We walked about 1/3 of a mile before he marked his stopping placeâ€¦ and took a 6 hour break. Team Geezer went to lunch/dinner and took care of our needs. At 5:30 Geezers were back in place. Rob showed up shortly after six, and by 6:10 he set out walking toward St. Elmo. We watched from behind for a few minutes then drove two miles up the road where I got out of the car to walk with Robert. Shortly after we began walking, together Robert started to run. We covered the next mile at about 9 minute pace with him gradually increasing the speed. He asked if he was going too fast and I told him I had a 100 miler coming up and wanted to run closer to the pace for that event. Robert then blasted off running the next mile at or around seven minutes, he slowed slightly, got a drink from the RV than began walking shortly afterwards. I plugged along at 10:30 per mile pace, and within a mile (32 minutes from when we began walking together) we were back together three miles down the road and walking again. I got back into Geezer Support Vehicle #2 shortly after that. We continued to monitor until RY took a break at a Walgreens in Effingham at 11:30 pm. He was still there when the Geezers had a shift change shortly after 2 am. As the shift change took place RY emerged from the RV and began walking again. I saw him next at the 12:00 noon shift change. The entire team Geezer stayed on the job until he stopped at what he and his crew were calling 60 miles for the day. I think it may have been slightly less on the map, but he remained a set distance from NYC, so I was not worried about an exact number. At that point Robert was going to take a break in the heat of the day until 6:00 pm. We recorded a brief video marking the time and place he stopped. At 6:00 pm Geezer team 2 was in place. RY emerged from the RV at 6:22 and began walking at 6:29. 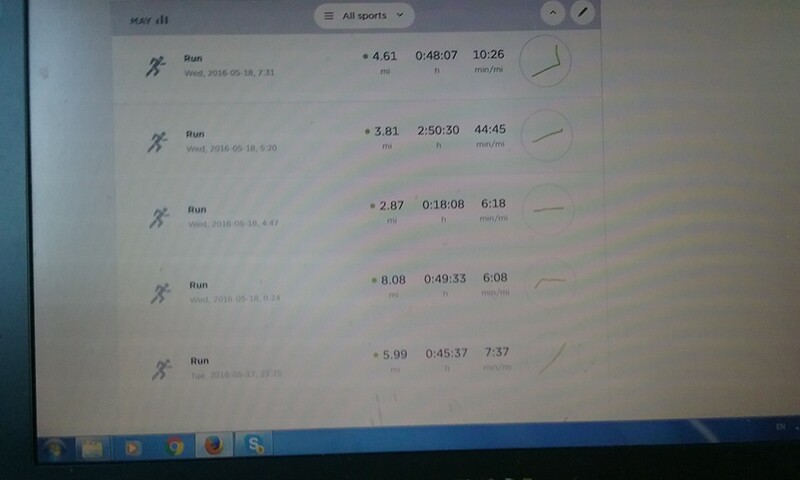 After some walking he began running and recorded a three mile section in about 30 minutes. He continued running and breaking with the running becoming less and the walking more. The entire pace was slowing. He took 1:24 to cover the next 3.2 miles. He did state that he had to take two breaks in that section. He continued to show signs of fatigue. He took over an hour to complete the next 1.8 miles, again with a long break. At one point he walked up to the RV and crossed his arms on the window and lay his head there. He stated he was knackered (a British term meaning exhausted I learned while running a 6 day (463 miles) in 1984.) His crew told him he was Â½ mile from the Indiana Border. I sang the chorus from â€œIndiana Wants Meâ€ by R Dean Taylor) and he set off for Indiana. There was no sign â€œWelcome to Indianaâ€. RY hot there and we took pictures in front of a sign that said â€œWelcome to Vigo Countyâ€. At that point Robert sat on the ground for a few minutes before going to the RV to sleep. The Geezers made a shift change. RY rested until 3:30 am then commenced traveling. There was no running off, he was slow. He completed 40 miles for the day by noon, and went to a motel to rest before resuming again at 6:00 pm this afternoon 6/15/2016. I will be there when he resumes his effort. A few side notes. Robert expressed concern about not being believed. I told him there were many questions about his data. He claimed people were looking at small sections of data. I agreed that while this was true that there were also people looking at maps and taking point A then point B 10 days later. They were concerned that his 10 day totals were international class, with some sections world class. He stated he would like to run the Sri Chinmoy 10 day race. He said he feels his best talent is in multi day running. He said he wants to run ultras. I told him that would be good as most runners who are questioned, then challenged to show up at races do not do so. We talked running. He feels he could approach, and hopefully surpass 500 miles in a six day run. Robert is tired. He is in a place many of us have been, fighting fatigue and pain. Individually they are formidable opponants. Together they are oppressive. I am off to observe once again. Watch this space. I just may share more observations. Any Indiana State runners who want to meet Rob on the road this week? He's heading your way. He's very friendly and needs the support. team1.kml, it seems we have independently arrived at the same conclusion. You beat me to posting. Tracker stops moving at 6:11am local time ( 9:11am eastern on tracker data) and stays motionless for a long time. The RV is stuck. +10-20min trying to get it unstuck. +10-15min Rob packing to run. Rob claims to leave at 6:45. and run 36 miles at about 8:45 avg pace. Rob on facebook the day after it happened: "Like stated before the vehicle broke down around 6:30am we have proof - many calls were made to get a toe truck again we have proof of times - we continued to run about 36 miles to Laughlin and arrived around 12 - whilst some of the crew got the truck towed out about 9am and then had to tow again a further 2 times before heading to the same place. So do the maths as the route was fairly flat until a massive drop into the town - soon after 6:30 ok more like 6:45 and arrived around 12 that's 5 hrs 15 mind to do 36 miles on flat / downhill is that inconsistent -"
From the blog: "After 10 minutes putting rocks under the wheels and digging sand away from the wheels ourselves, we called the Emergency rescue number and got Rob packed to run on his own until we could catch up with him. He left and we waited for a pick up." However tomtom photo http://i.imgur.com/RV8l42Y.jpg shows a 4.6 mile 48min run (10:26pace) starting* at 7:31am, the tiny map puts the location right for leaving the stuck RV. The rest of the run to Laughlin is not shown. 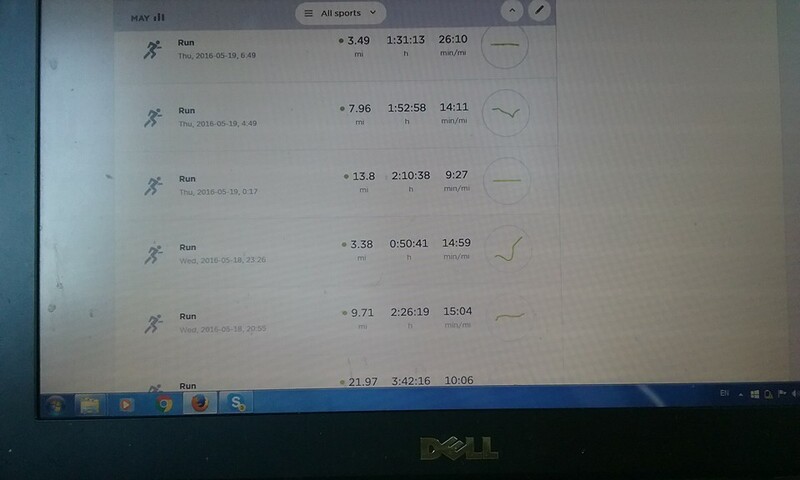 But there is a tomtom pic of 22 miles in 3:42min with the date cut off here http://i.imgur.com/jcH6bZB.jpg . Based on the one above it, this one should be his run into Laughlin. At 9:30 the RV gets on the road per tracker. So we have a classic "two trains leave the station" problem. If rob left at 7:30 and RV left at 9:30, then the RV easily overtook him at about 10am if his 10:00 pace continued. At 12:52 local Rob is at the pool. http://bit.ly/1UzFoI2. He says he arrived around noon per quote above. 7:30 departure + 0:48 run (4.6mi) + 3:42 run (22mi) =12:00 arrival. But that's only 26.6 miles and he claims 36. *It appears tomtom times are local time taken when the run is started. Someone please verify this. 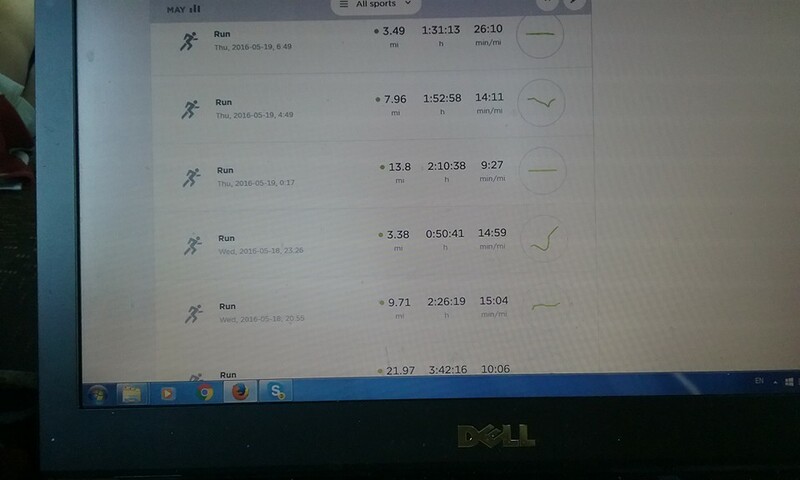 I looked at tomtom runs vs tracker points. E.g. 5/18/16 23:26 tomtom run here http://i.imgur.com/3V7BkN2.jpg vs tracker point 5/19/16 02:24. Sounds like he's in a bad state, what is his medical support like out there? Any medics that would be prepared to go out and meet him and make sure he's ok? LRC runners can do intervals on the road and do their walking breaks with Rob! Agreed. RY needs to stay safe, take a break. Are you a p-ussy? Who cares about his safety? No mercy for cheaters please! RE: Robert Young fakes run across America 6/15/2016 5:22PM - in reply to Rob- nice guy & a cheater too! Jesus (I mean Robby, sorry; I keep forgetting) ran 70 miles a day across the desert and the canyons and the mountains, in brutal heat and wind, lots of it at 6 and 7-minute pace, without even struggling. Looked fresh as a daisy in every picture, had time to go for fun side-trips, hang out and watch movies, etc. Kept this up for 3 weeks, no prob. he's been reduced to a quivering blob of protoplasm, death-marching along at 30-minute pace, literally falling on his face with exhaustion, suddenly burned and blistered for the first time,... on the thin edge of expiration. Yeah, sure, it's probably just a coincidence. Throw all the insults you like but he is displaying many signs of mental illness and needs help. First physically but down the line he needs to address as to why he is creating this fictitious version of himself. I am actually rooting for him to complete this but only in a safe manner and so that he can reflect on it and hopefully draw a line and come clean. He cannot carry on after this and expect to continue deluding himself and conning the public. As I said, I think there is path forward for him if he can take responsibility and earn the respect he wishes for honestly. I think this is the case as well. The map thumbnails and start times of the segments leading into and out of Laughlin line up pretty well. For example, the 7.96 mile segment at 4:49 (second entry in the link you posted) is almost certainly the beginning of the stretch they made into Kingman at 7:47:27 19-May according to the tracker. So tracker is in Eastern (always) and TomTom is local time (Pacific time for CA, NV, and AZ is currently with Pacific as well) and is associated with the beginning of the segment. RE: Robert Young fakes run across America 6/15/2016 5:26PM - in reply to not the full shilling? Books need to be sold, sponsors need to be pleased, Park Run moms need to be awed and rent needs to be paid.